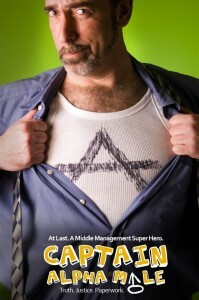 Meet Captain Alpha Male, the world’s first middle-management superhero! He’s a man’s man, a hero’s hero. And he’s about to get the promotion he’s worked his whole life for. Maybe not. At last, a middle management super hero! Truth, justice, paperwork! Tagged with Captain Alpha Male.